Hello! 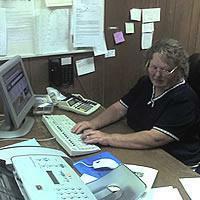 My name is Sandy and I have worked at Narrows First UMC since February 2007. I joined this church in 1981. My husband and I professed our faith in Jesus Christ and were baptized in the early 1970s when we began raising our children. We were both raised in Christian homes and so we wanted to serve God and raise our own children in the church. Today, our children are raising their own children in the church. I take pride in the beauty and history of our church. I truly enjoy working with everyone. I have a passion for working with children and older adults. In 2007, we started a children/youth video group that meets once a month. We view videos, discuss Bible Stories and have fun fellowship events like swimming, bowling, hiking and horseback riding.